Emrys Williams: There are several distinct thematic strands each anchored around a repeated object or construction. Viewed as groups of works, this repetition suggests a kind of obsessive need to catch and imprint a particular idea or memory or feeling - to examine it. Perhaps even dissect it. As individual paintings they work differently. Despite the range of colours and objects which fill many of the pictures, there is an unmistakable feeling of loss, of melancholy and stillness: Figures stand alone, facing away, out to sea, under umbrellas, watching boats as they pass desultorily. And the zebra, the poor zebra: always alone, always waiting, always out of place. A left-over memory. These paintings are full of memory and allusion, they echo the themes and styles of earlier ages. This knowledge and erudition, intelligence and consciousness of tradition all add to the sense of cool detachment in the work. Perhaps the artist is observing himself? These paintings can sustain many narratives, but they retain their inscrutable, aching mystery. 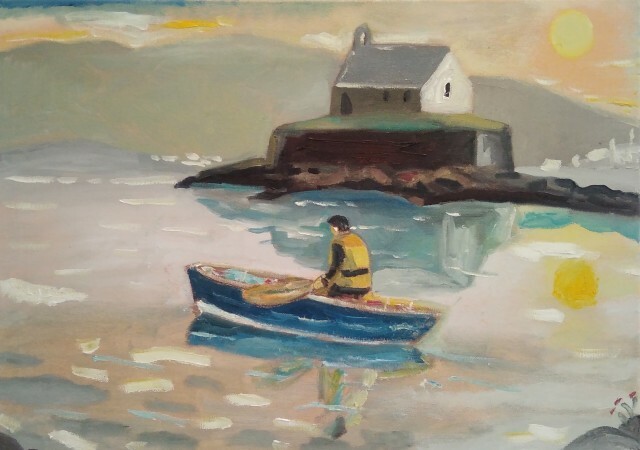 Emrys Williams has won a number of major prizes in Wales including the Gold Medal for Fine Art at the National Eisteddfod (2007), the Welsh Artist of the Year Painting Prize (2006), and the University of Glamorgan Purchase Prize (2006). His work is represented in many public collections including the Government Art Collection, The arts Council of England, the National Museum of Wales, and the Metropolitan Museum of Art, New York. Emrys Williams has had two major exhibitions with us.